Unit vectors that are perpendicular to a surface (so, they describe the orientation of the surface) are called unit normal vectors. Though, usually they are just abbreviated as normals. Normals appear in planes, 3D geometry (to determine where each face or vertex is siding), etc. A normal is a unit vector, but it’s called normal because of its usage. (Just like we call (0,0) the Origin!). It’s as simple as it looks. The plane passes by the origin and the surface of it is perpendicular to the unit vector (or normal). The side towards the vector points to is the positive half-space, while the other side is the negative half-space. In 3D this is exactly the same, except that the plane is an infinite surface (imagine an infinite, flat sheet of paper that you can orient and is pinned to the origin) instead of a line. This allows us to tell which side of the plane a point is. I know what you are thinking! So far this is nice, but real planes are everywhere in space, not only passing through the origin. You want real plane action and you want it now. Remember that planes not only split space in two, but they also have polarity. 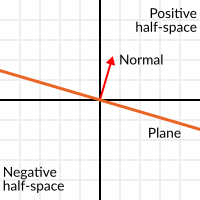 This means that it is possible to have perfectly overlapping planes, but their negative and positive half-spaces are swapped. For 3D math, Godot provides a Plane built-in type that handles this. This will, again, return either a positive or negative distance. So, remember, a plane is just that and its main practical use is calculating the distance to it. 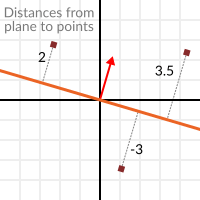 So, why is it useful to calculate the distance from a point to a plane? It’s extremely useful! Let’s see some simple examples.. Planes clearly don’t come out of nowhere, so they must be built. Constructing them in 2D is easy, this can be done from either a normal (unit vector) and a point, or from two points in space. 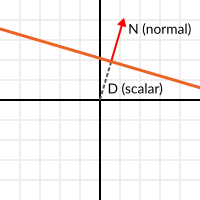 In the case of a normal and a point, most of the work is done, as the normal is already computed, so just calculate D from the dot product of the normal and the point. Doing the same in 3D is a little more complex and will be explained further down. Here is a simple example of what planes are useful for. Imagine you have a convex polygon. For example, a rectangle, a trapezoid, a triangle, or just any polygon where no faces bend inwards. For every segment of the polygon, we compute the plane that passes by that segment. 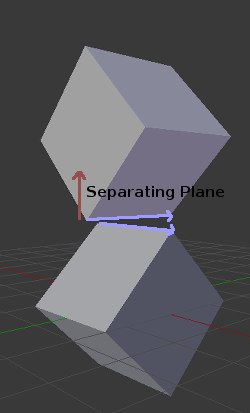 Once we have the list of planes, we can do neat things, for example checking if a point is inside the polygon. We go through all planes, if we can find a plane where the distance to the point is positive, then the point is outside the polygon. If we can’t, then the point is inside. Pretty cool, huh? But this gets much better! With a little more effort, similar logic will let us know when two convex polygons are overlapping too. This is called the Separating Axis Theorem (or SAT) and most physics engines use this to detect collision. As you can see, planes are quite useful, and this is the tip of the iceberg. You might be wondering what happens with non convex polygons. This is usually just handled by splitting the concave polygon into smaller convex polygons, or using a technique such as BSP (which is not used much nowadays). Remember that converting a convex shape in 2D to an array of 2D planes was useful for collision detection? 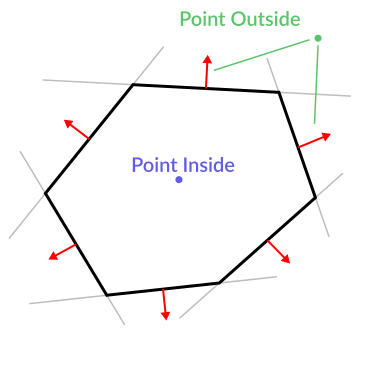 You could detect if a point was inside any convex shape, or if two 2D convex shapes were overlapping. Well, this works in 3D too, if two 3D polyhedral shapes are colliding, you won’t be able to find a separating plane. 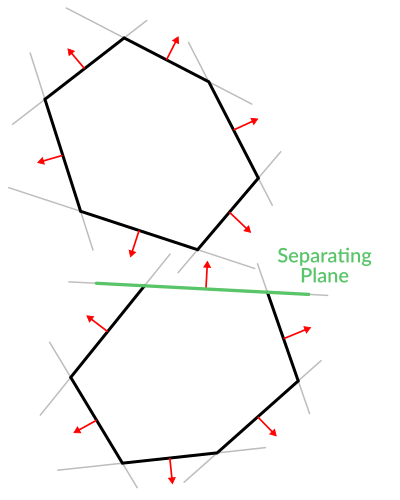 If a separating plane is found, then the shapes are definitely not colliding. To refresh a bit a separating plane means that all vertices of polygon A are in one side of the plane, and all vertices of polygon B are in the other side. This plane is always one of the face-planes of either polygon A or polygon B.